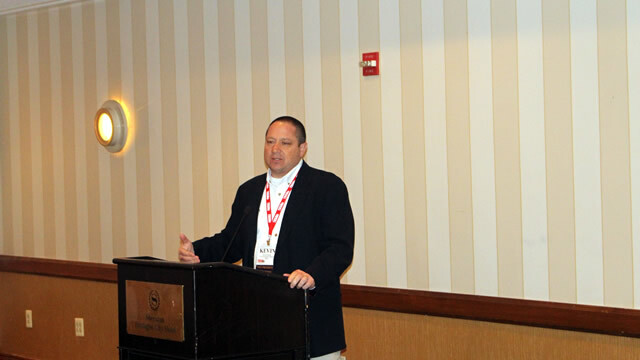 TRSA Vice President of Government Relations Kevin Schwalb recently gave an update to the international linen, uniform and facility services community on initiatives TRSA is working on to benefit the industry worldwide. Schwalb’s speech was part of the European Textile Services Association’s (ETSA) International Information Session at EXPOdetergo 2018 in Milan. Schwalb kicked off his address with an overview of TRSA’s mission, as well as a look at the linen, uniform and facility services market in the United States. TRSA research indicates that this $20-billion market has the potential to be a $34-billion market with an uptick in outsourcing. The largest opportunities appear to be in restroom hygiene and chemicals, as well as direct sales of garments and uniforms, Schwalb said. TRSA also hosted a booth at EXPOdetergo International, held from Oct. 19-22 in Milan.